South Coast Promotions has been the web designer for Jaybees Entertainment and Booking Agency for over 20 years. In Jan 2011 the website www.jaybees.com.au was converted to a real time media website. We are known as Cathy Dee in the music industry. The website is updated weekly with the South Coast Gig Guide. Jaybees Entertainment Booking agency is operated by Narrell Brown, serving the South Coast from Wollongong to Eden and other areas in NSW. The gig guide is updated weekly whilst each month a new band and/or entertainer from Jaybees Entertainment agency list is featured on the website. Venues and or organisers are able to browse the site and choose entertainers to suit their clientele needs based on location and tastes. Originally established by John and Narrell Brown and licenced in June of 1990, the aim of this agency was to provide a service to both the musicians and the venues to meet the needs of the entertainment industry on the South Coast. In regional areas, it is not enough to just be a booking agency, or just be a PA Hire company or indeed to only offer a specific service. The needs of performers and the performance spaces as well as the audiences are all different but can be accomodated by a central agency with a sound understanding of the industry as a whole. 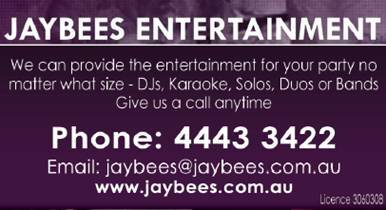 Jaybees supplies all facets of live entertainment, in fact, with over 2000 listings Australia wide, they have entertainment for every occasion. Jaybees Entertainment is dedicated to providing you with the highest quality entertainment and professional service. They bring to your event 30 years of experience and a roster of the most noteworthy bands, DJs, artists and entertainers available. Jaybees are confident your entertainment selection will be a great success and look forward to assisting you in the process. Management and Promotions – for everything in entertainment! © 2019 South Coast Promotions.